The 2012-2016 drought is one for the records in that, while not necessarily the driest or the longest for California since the state has been keeping records, it was the hottest drought with many scientists saying that we can expect similar droughts in the future. 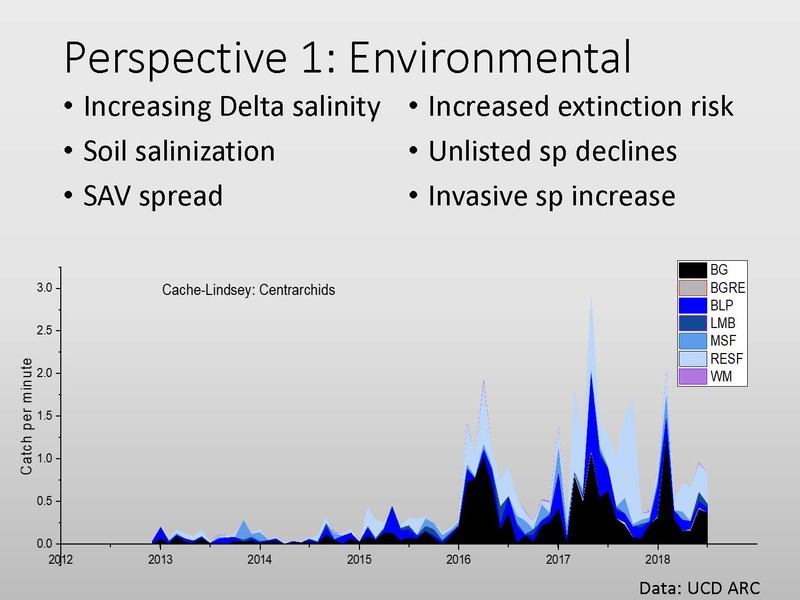 John Durand, a research scientist at UC Davis, gave this presentation at the 2018 Bay Delta Science Conference that looked at the impacts of the drought on the Delta from the perspectives of the environment, the economy, and Delta stakeholders. 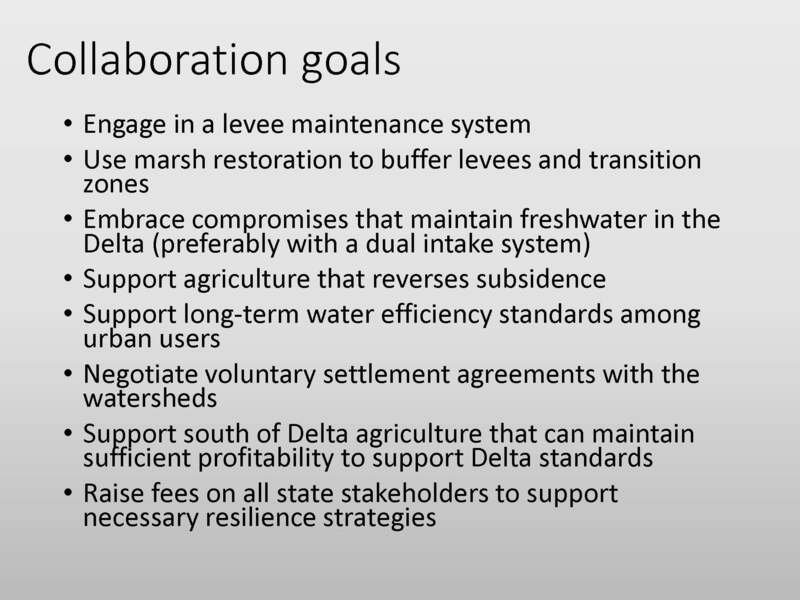 John Durand began by saying he has been spending a lot of time, thinking about the big picture around restoration strategies for the Delta and the Suisun Marsh, and how the recent drought and climate change factor into it. The trends that were seen in the last drought should drive our thinking about not only preparing for future droughts, but also preparing for climate change. The 2012-2016 drought wasn’t the driest or longest drought in California history, but it was in some ways the driest, longest, hottest drought, he said. 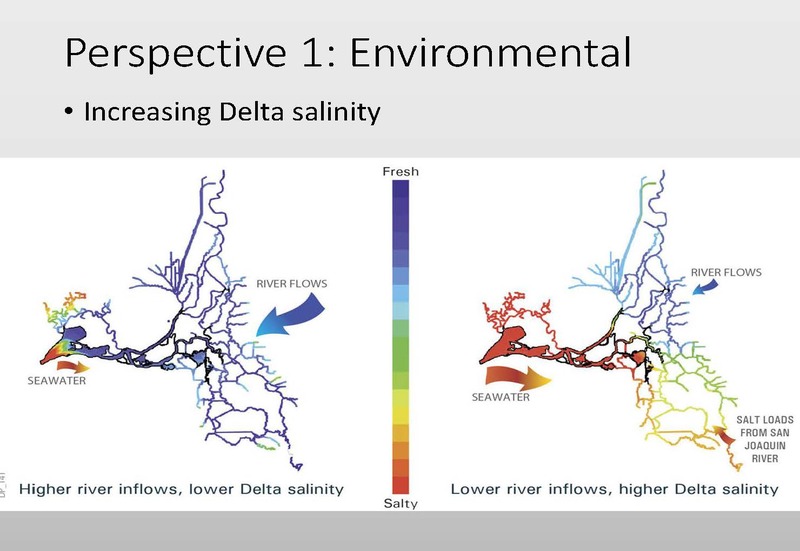 Increasing Delta salinity was a feature of the recent drought and it will be a feature of climate change, Mr. Durand said, presenting a slide showing Delta salinity in high and low flows, noting that it was from a model done by RMA. 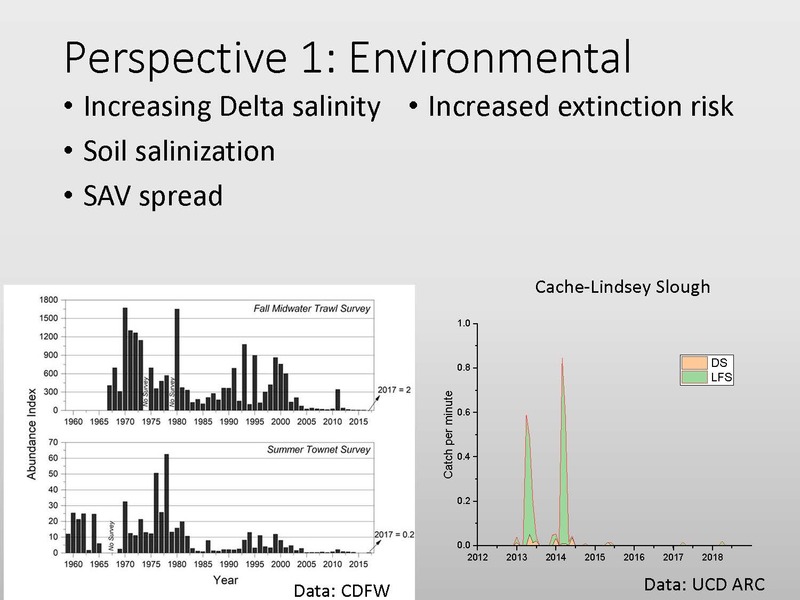 During the recent drought, salinity was largely managed by the implementation of a barrier in West False River, but there were salinity exceedances throughout the Delta, and these had an impact, not only on fish communities and the aquatic community, but also on soil salinization in the Delta, and Delta agriculture, he said. 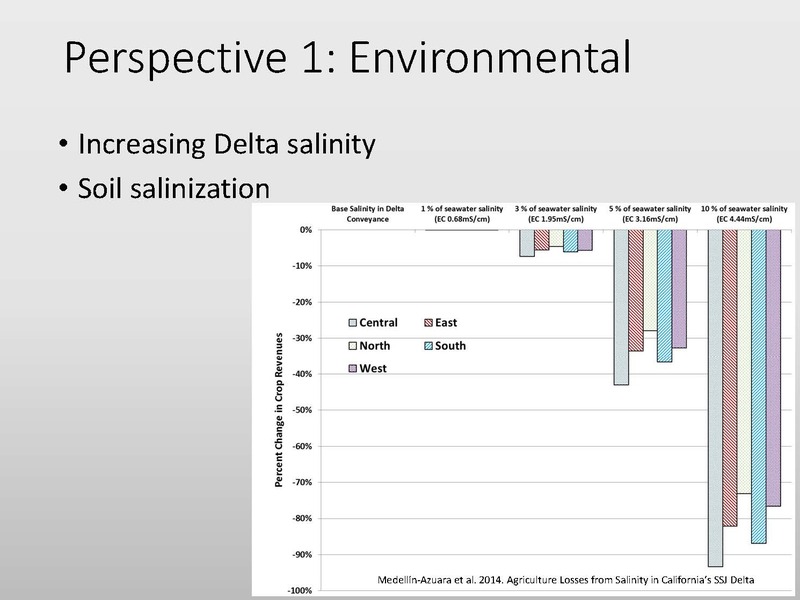 Mr. Durand said there was a lot of anecdotal evidence that soil salinity increased and that it had some affect on crops. 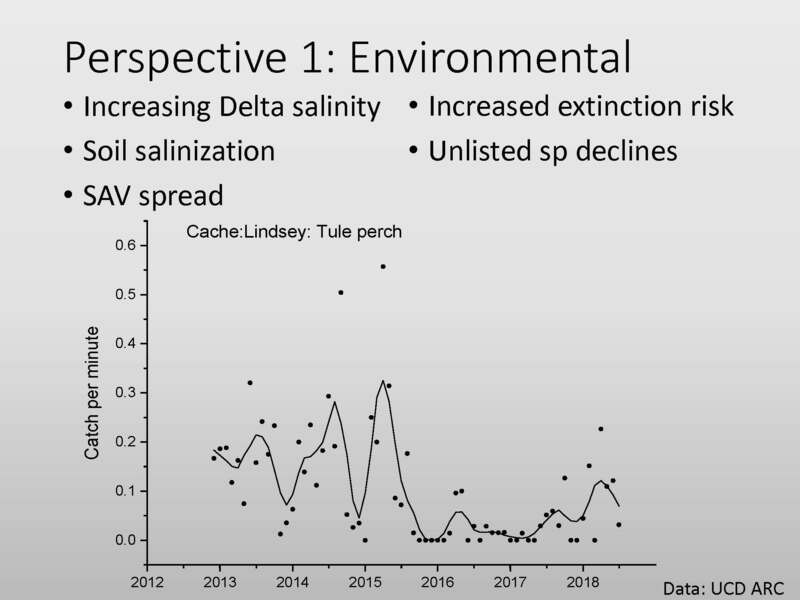 There was a voluntary fallowing program which turned out to be beneficial for a number of reasons for growers because of the increasing salinity as it minimized their risks and gave them a plan B. 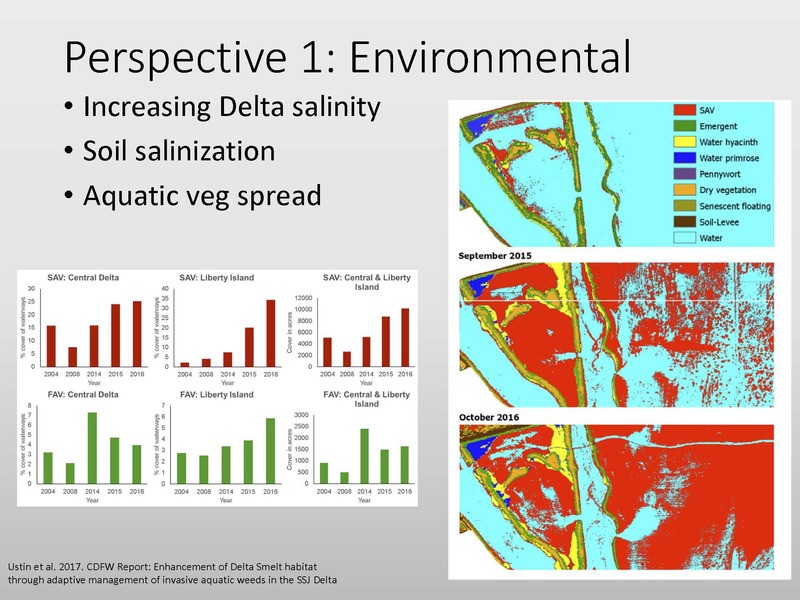 He presented a model of decreasing crop revenues as a function of increasing salinity in the Delta, depicting the trend of loss of agriculture revenue as a function of increasing salinity in the Delta. Finally, sea level rise. Although sea level rise is not part of the drought, it will be putting pressure on our systems going into the future, he said. Mr. Durand then turned to the economic perspective. 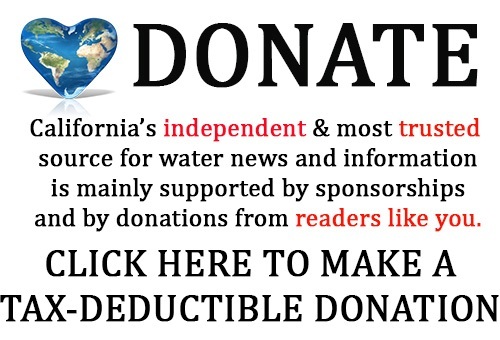 During the recent drought, the state’s total economic losses totaled about $10 billion, which is less than .1% of the California’s $2.5 trillion economy. “It turns out that the drought impact on the economy was much less than the impact from just standard business cycles, from federal policies, and international exchange,” he said. 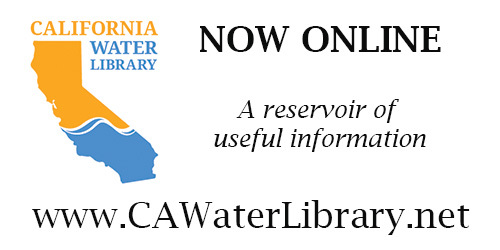 More recently in the past couple of droughts, innovations have occurred including interties between water systems which can be used in conjunction with water markets to get water from where it is to where it is needed. It has provided a lot of flexibility that in many ways sustained a variety of communities and a lot of industrial sectors across California. 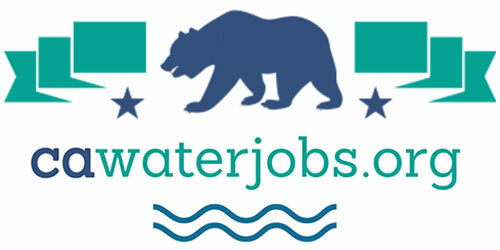 “During the drought in spite of the crisis, in spite of the overall trend, California’s probably well suited to manage changing climate going into the future with an abundance of resources,” he said. 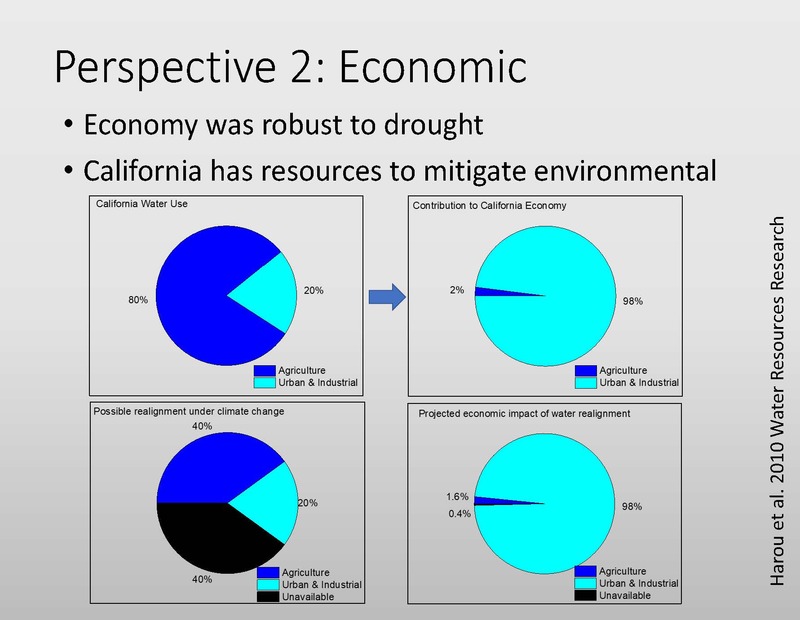 He presented a pie chart (lower, left) showing the different crops grown in California, noting that most of the value in agriculture is in tree crops. “Very little of this value derives from other crops,” he said. 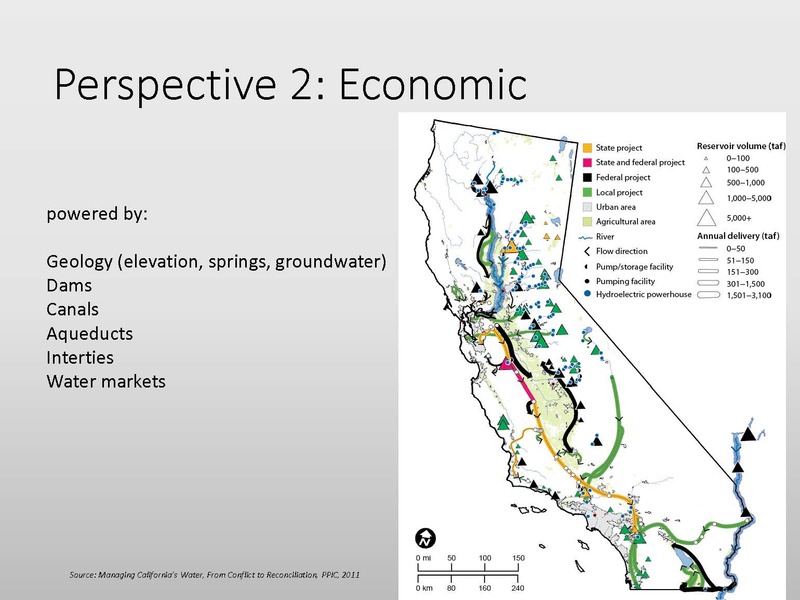 Agriculture uses about 80% of California’s water while urban and industrial gets about 20%, but ag is contributed just 2% to the overall California economy. “It’s not a big part, but it’s a very essential part of the economy and it has a critical role in our society, almost like a utility function,” he said. 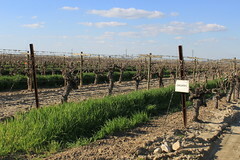 “We support ag because it’s necessary to feed people … but the fact is that our economy and agriculture is quite resilient to changes in water supply, so if we took off half of ag’s irrigable crop area, it would result in an impact of about 0.4% – that is it would reduce ag to about 1.6% of the total state economy. Tidal energy loss is a threat to the environment that doesn’t affect the others but the interests of agriculture and water exports largely overlap, he said. 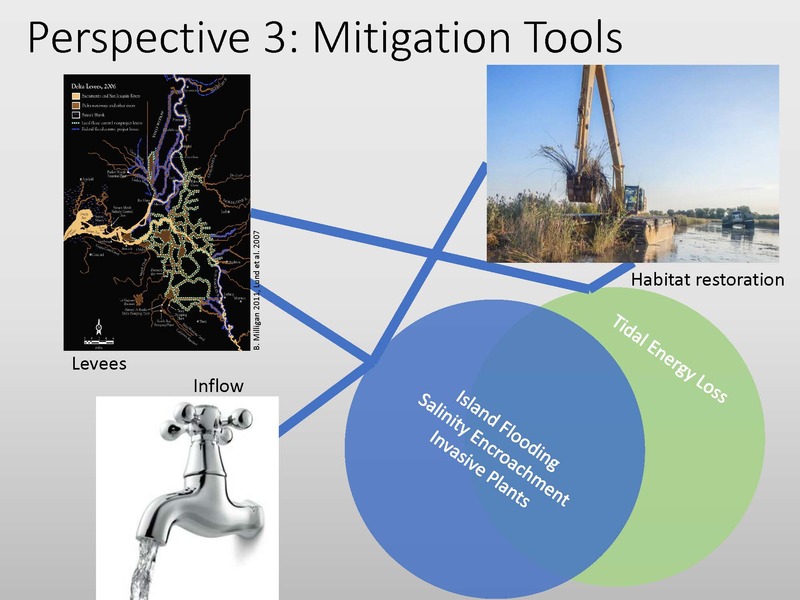 The threats of island flooding, salinity encroachment, invasive plants, and tidal energy loss can be managed with habitat restoration, levee maintenance, and managing water inflows, which he acknowledged are all expensive propositions that require a lot of effort. There’s broad overlap in how they’ll be managed as well as broad overlap in terms of ag, exporters, and the environment relying on these same tools, he said. 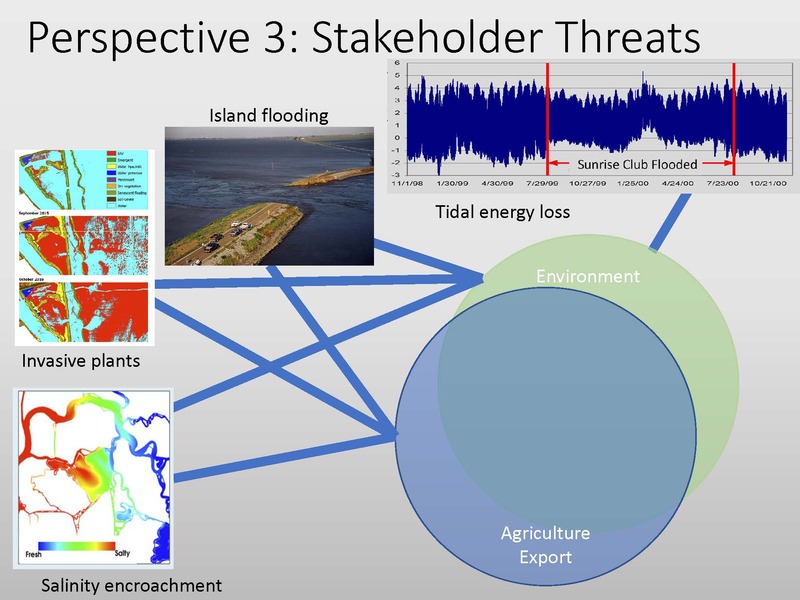 Tidal energy loss can be managed mostly through careful habitat restoration but also requires the levee system, he noted.